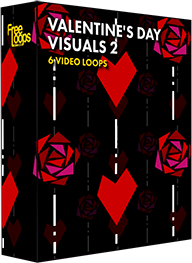 Roses and hearts in a cool graphic style form an awesome moving background, this Valentine's Day video loop makes for an intriguing display. A neat video design for you to experiment with. This video loop is part of Valentine's Day Visuals 2.